"Handbrake works well for me whenever I want to rip DVDs free, but it keeps crashing after I update my Mac. No matter how many times I tried, I could't get any luck. Googling around I found the reason is the incapability of Handbrake to support the latest Mac OS X. What should I do if I want to rip DVD on the new version? Is there any Handbrake alternative for Mac OS X Yosemite?" Sounds familiar? Most Mac users may have encountered the same problem. HandBrake is a general-purpose, open-source DVD decoder and video transcoder software application. But its achille's heel lies in the slow speed to support the Mac OS. Though Handbrake 1.0.7 claims that it's compatible with Mac OS X 10.9, it actually does not work as it should under the same, let alone the new version Mac OS X Yosemite and macOS Sierra. As of writing, no sign indicates that the Handbrake's incompatibility issue with the latest Mac operating system Yosemite, will be solved in near future. No more wait, let's find an alternative for Handbrake that can work well on the latest OS X 10.10 and 10.12. Among those software capable of accomplishing the same tasks as Handbrake, MacX DVD Ripper Pro stands out with its prominent DVD ripping features, easiness and fastness. This Mac DVD ripper is updated constantly to support the newest Mac version, including the latest Mac OS X 10.10 and macOS Sierra. As the best Handbrake alternative for Mac OS X Yosemite and macOS Sierra, the DVD ripper for Mac guarantees a flawless DVD ripping to MP4, MKV, MOV, AVI, WMV, FLV, etc, which Handbrake cannot manage to do. Instead, Handbrake complicated DVD to iPhone presets, Handbrake cannot rip 99-title DVD, Handbrake audio-video sync error occurred. So for a once-for-all solution, you can count on this tool like Handbrake for Mac 10.10 and 10.11 to circumvent all the issues. Below is the detailed guide on how to rip DVD on OS X Yosemite/El Capitan/macOS Sierra using the Handbrake replacement. Free download this Mac Handbrake alternative on Mac, and then run it; click "DVD Disc" or "DVD Path" button to import the DVD you want to rip on your Mac. From the drop down menu, choose one output format you want on your Mac or simple convert new movie DVD releases to your portable devices such as iPhone, iPad, Android, etc. Click the "Browse" button to choose the destination you want to save the output DVD video. Click the "RUN" button to start to rip DVD to Mac with the Handbrake alternative. You can view the whole progress and are able to cancel it at anytime. As a matter of fact, MacX DVD Ripper Pro can do far more than acting as Handbrake replacement for Mac OS X Yosemite/El Capitan/macOS Sierra . It is, in all aspects, superior than Handbrake. It's faster, better with more output options. A distinct feature it offers that is not available in most other Mac DVD ripper including Handbrake is its ability to strip encryption from Disney copy protection, Sony ARccOS, region code, CSS and RCE, UOPs. 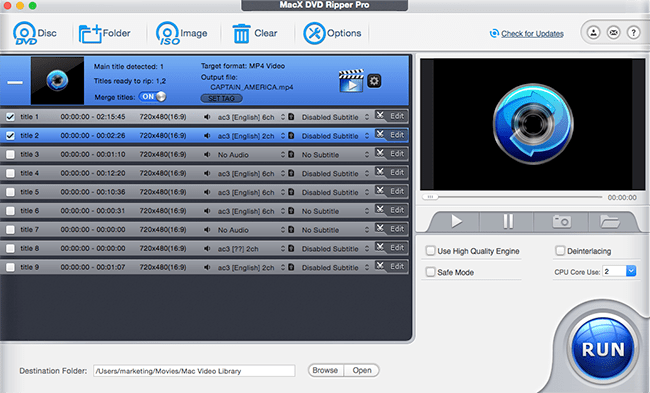 For your reference: To play the ripped DVD content on your mobile devices, you can rely on MacX MediaTrans to copy videos from computer to iPhone iPad iPod. Of course, you also can use this iOSfile manager to transfer music from iPhone to Mac, move photos from iPhone to computer, create new ringtones and more. 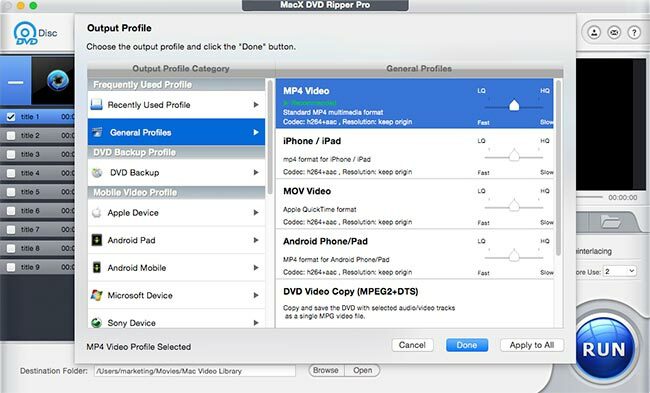 MacX DVD Ripper Pro, sought-after alternative to Handbrake can easily rip any latest and encrypted DVDs to AVI, MP4, MOV, WMV, MKV, etc on Mac/Win for compatible with iPhone iPad Android devices by removing various copy protection.